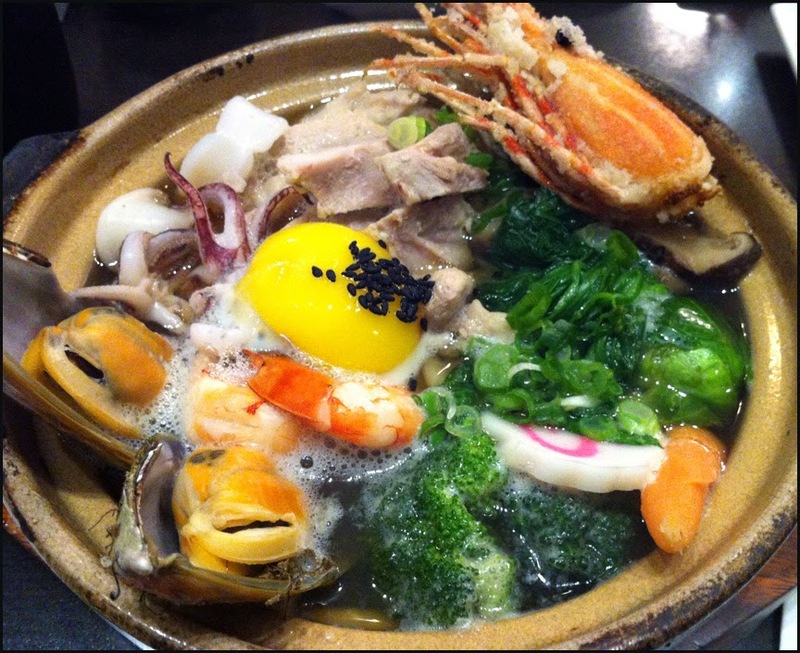 When it comes to comforting and hearty dishes, Asian nations favour “noodles in soup” dishes. Pho, laksa, wontons and TBN are just a few that come to my mind. From Japan, ramen maybe the most renown and top of mind noodle dish. However when execute well, I would argue the humble Nabeyaki Udon is just as complex and satisfying as its rock star cousin. Traditionally cooked in a metal pot (nabe) this udon dish contains morsels of meat, veggies, Tempura and a poached egg; all enveloped in delicious broth and paired with al dente udon. The broth is further heightened when you gently mix the runny egg yolk into the soup, adding a layer of creaminess. Despite the 600+ Japanese eateries in Vancouver, a good version of Nabeyaki Udon is hard to find. Generally, this dish is either not found on the menu or poorly executed with dashi broth made from powder and uninspired toppings. Finally, I found a NabeYaki Udon that was worthy to write about at Tatsu Japanese Bistro. Either serve in the metal pot it was cooked in or in an earthen heavy casserole vessel, this udon dish is robust and hearty. Tatsu’s version came in a heavy ceramic pot and was laden with goodies, traditional and unexpected. The usual suspects of a poached egg, fish cake, fresh shitake mushrooms, carrots, broccoli and tender chunks of chicken were present. However as you can see in the picture a much larger bounty of ingredients was also used. Mussels, slightly chewy shrimps and pieces of squids, spinach and the surprising Brussels sprouts were also added to this hearty meal. The deep-fried spot prawn head serve as the tempura component of this dish. As much as it was visually stunning, I thought it did not work as well as an edible item and I would of preferred a whole tempura prawn. The broth had a real deep umami flavour without the hint of artificial dashi broth, which plagues most udon dishes in the city. This, “everything and the kitchen sink” udon served at Tatsu was the perfect, satisfying cure all for Vancouver’s rainy days. Tatsu Japanese Bistro is pan Japanese restaurant. 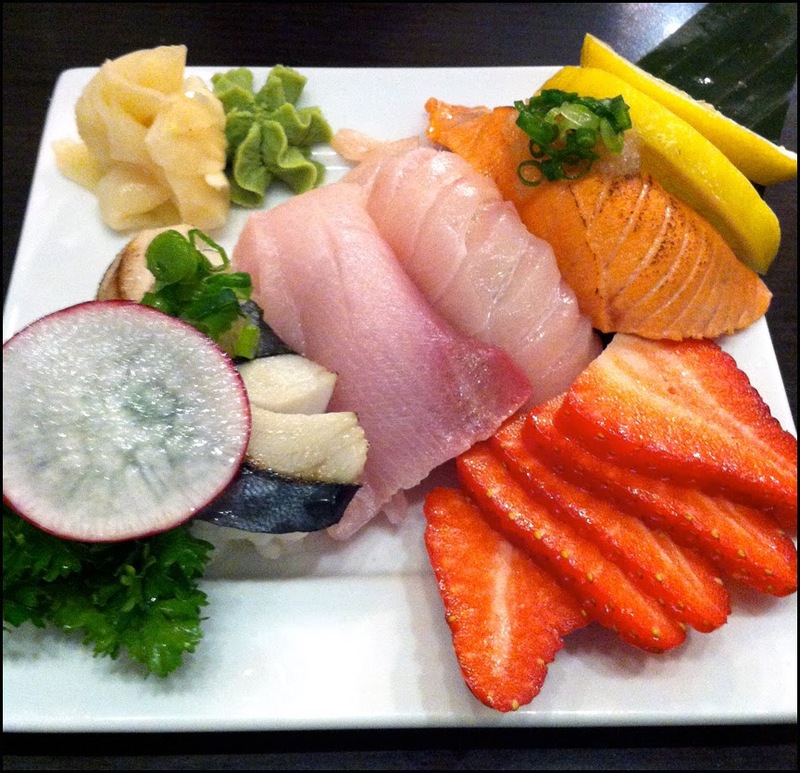 In additional to the Nabeyaki Udon, Tatsu serves both traditional sashimi and sushi, and more innovative fusion rolls and creations. I was lucky to have Speedy come along with me on two visits to this Commercial Drive eatery and we got to sample a wide range of items on the menu. In appetizer section, we tried the Renkon Gyoza and their original sushi pizza. I found both a little clunky and odd texturally. Tatsu’s deep fried lotus root burger didn’t have the same finesse as Hapa Izakaya’s version. 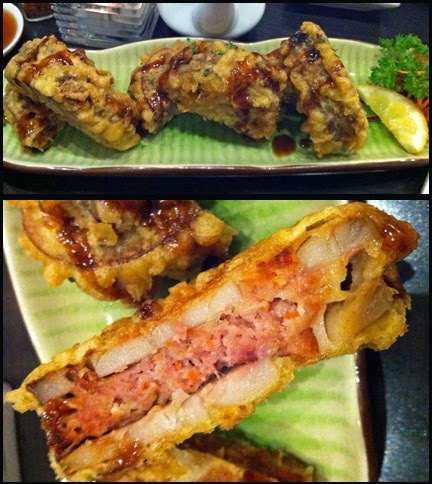 The one from Tatsu were much larger and covered in more tempura batter; yet it didn’t yield a crunchy appetizer. I think because of its size, Tatsu’s rendition had to be cooked longer and resulted in a softer lotus root. In addition I didn’t feel the pork filling had a distinct flavour. As a result, each bite of the Renkon gyoza was a soft sweetish mouthful, undistinguishable from the lotus root and the pork filling. 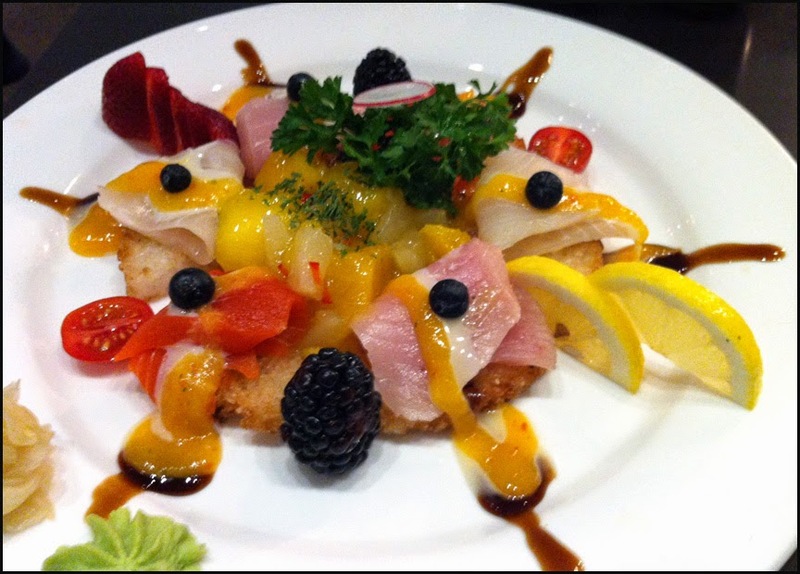 The original sushi pizza was loaded with fresh salmon, tuna and tai sashimi and fruit. The problem I had was the crispy rice pizza base. I found it jarring to bite into the soft delicate fish sashimi and fruit, and then the very crispy slightly nutty fried rice. It was a combination that didn’t work for me. Another misfire for me was their Fish & Chip fusion roll. I felt the roll was greasy and heavy with its deep fried fish and tatar sauce inside, and crunchy fried bits on the outside. I think it needed something acidic to help balance out the roll as all I got we with each bite was oily taste. Both Speedy and I found the basic rolls and nigri more enjoyable. The ordinary negitoro and tamago maki were well made. 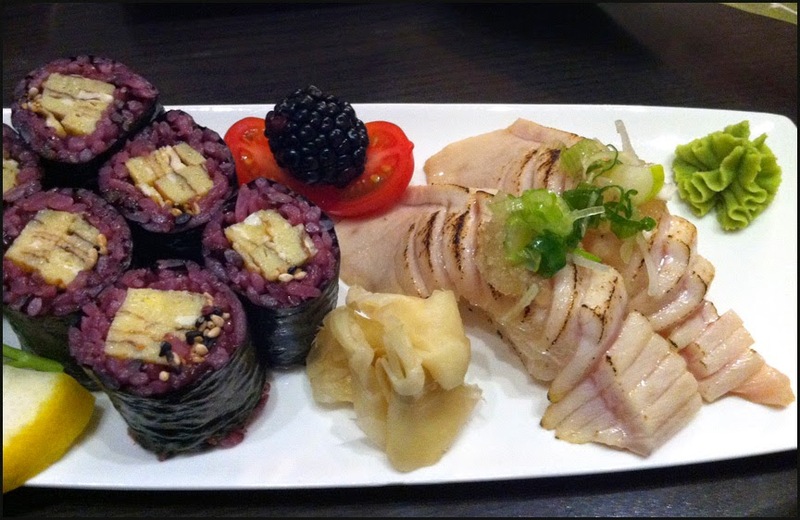 With the tamago maki I asked for black rice instead of plain white sushi rice. It was an eye opener with the yellow tamago and purplish rice. In terms of taste I did taste a nutty accent but I wasn’t sure if it was the rice itself or the shavings of sesame seeds embedded in the black rice. When it came to the nigri (hamachi, saba, aburi salmon, tuna & aburi tuna toro), I found the sushi rice well formed and topped with fresh fish. I particularly enjoyed the aburi tuna toro, the heat from the torching helped release the fatty flavour of the tuna. Overall, I found Tatsu used quality ingredients, good preparation and great presentation with fruit accenting many of the plates we ordered. I feel sushi should be light and have clean flavours. Tatsu’s nigri and simple maki hit the right notes in my book. However the one item that will make me return to Tatsu without hesitation is their soul soothing Nabeyaki Udon.